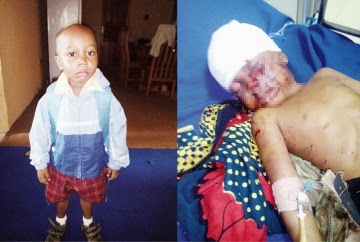 4-year-old boy attacked by dogs in Lagos; ...scalp chewed off! Four-year-old Omonigho Abraham is currently battling for his life at the Lagos State University Teaching Hospital, Ikeja, after his scalp was eaten by two dogs. The dogs chewed the skin and exposed the victim’s skull during the attack which happened on Thursday on Adegboyega Street, Akesan Estate, in the Igando area of Lagos. PUNCH Metro had reported last week that the police arrested the two dogs for attacking Omonigho. However, it was learnt from eyewitnesses that the dogs dragged him through the compound for more than one hour while policemen and sympathisers watched helplessly at the entrance of the house for fear of being attacked by the savage dogs. The immediate elder brother of the victim, seven-year-old Osemudiamen, told PUNCH Metro that the dogs had chased him, Omonigho and their elder brother, Bobby, while they were taking turns to ride a bicycle. He said, “We were riding a bicycle in the compound when the big dogs ─ Jack and Gadaffi ─ started barking at us. Later, they moved towards us. “My elder brother and I quickly ran upstairs and locked the door while Omo (Omonigho), who could not run fast, was left behind. “When he got to the door, he knocked that we should open for him and as we did, one of the dogs forced his way into the house with him. “We all ran out. Bobby jumped down from upstairs and I also jumped. But Omo could not jump, so the dog attacked him. It was learnt that the screams of the children who managed to get outside attracted passersby and residents who besieged the house. No fewer than seven policemen from the Igando Police Station reportedly stood at the gate, confused. The victim’s mother, Mrs. Helen Abraham, who was away when the incident happened, said her son had been injured by the time she arrived at the scene. She said, “When I got there, I met a crowd. They asked me not to go inside, but I refused to listen to them. One of the dogs emerged from the corridor with blood stains in its mouth. I ran inside. The other dog, on sighting me, pounced, but I fought back. It later ran away. I called on people who joined me to take him to a hospital. The victim’s father, Mr. Odia Abraham, said the medical personnel at the Igando General Hospital asked them to transfer him to LASUTH because of the severity of the attack. “The doctor at Igando said his condition was critical and we should take him to LASUTH. When the incident happened, I was away at work. “But when I got home, I saw parts of my son’s scalp on the floor. The dogs dragged him through the compound for about one and half hours and nobody moved near them. His face was also affected, but thankfully it did not get to his eyes. “His two brothers, who survived, also got injured. The seven-year-old who spoke with you has a fracture, which we are still treating. The other, who is 13 years, has a minor injury. “We marked Omo’s fourth year birthday in June. He is a very intelligent boy and he always tells me he wants to be a soldier because he loves to protect people. I am hoping this thing will not affect his brain,” he said. The police were said to have arrested the owner of the dogs, one Stanley Wesley. A resident said the people living in the house had warned Wesley about his dogs but he refused to listen. She said, “We became alarmed when he brought a third dog recently which was more ferocious and bigger than the others. Whenever he took that dog on a walk, even adults would be scared. The Police spokesperson, Lagos State Command, DSP Kenneth Nwosu, said the police were the ones that actually rescued the victim. Nwosu said, “I can confirm to you that on September 25, at about 5.40pm, dogs belonging to one Stanley Wesley attacked and harmed a four-year-old boy and the matter was reported at the Igando Police Division.